SCORE is mentoring group of retired business men and women who provide free counseling services for clients wishing to gain business advice. Members of the Muscatine community may use this resource if they are planning to start, grow or maintain their business. Each week the SCORE group meets to sit down with those looking for business direction. SCORE consultations are held Thursday afternoons 1:30-3:30 p.m. at the Chamber office. Appointments may be made by calling the Greater Muscatine Chamber of Commerce and Industry at 563-263-8895. 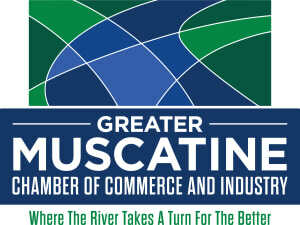 The Greater Muscatine Chamber of Commerce and Industry in partnership with the Iowa Quad Cities Chamber's New Ventures Initiative and the Eastern Iowa Community College District, has launched the new Business Information for Growth BIG service. This data-mining service provides Muscatine business owners and entrepreneurs FREE access to highly-sophisticated online databases and research that can help you identify new opportunities to grow and maximize your business. Let's say you want to find the number of businesses that are located in a particular market that offer a specific service. The BIG databases would be a great place to start to find that information. Access to these databases is often cost-prohibitive for many businesses, however, the BIG service is free of charge and it takes only a brief training session to learn how to use the databases. Click here to learn more about BIG. Click here to learn more about SBDC.